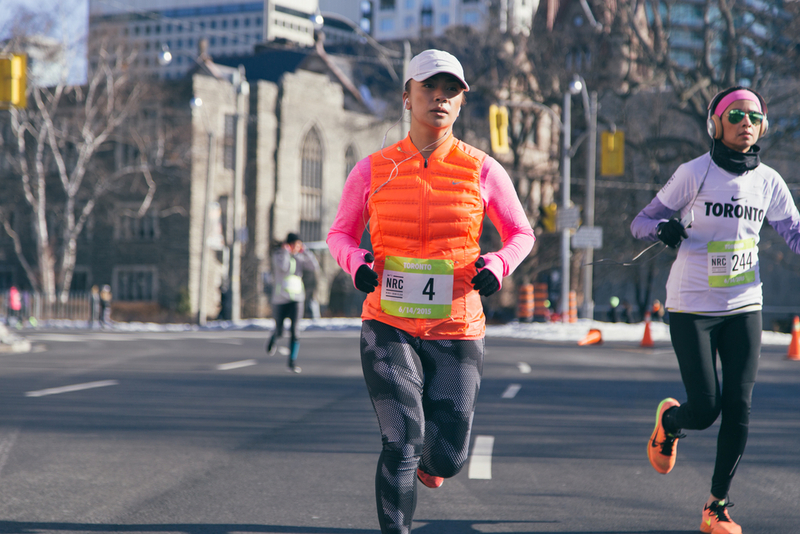 Nike Women's 15K Toronto - Registrations are Open - See you on the Road! On Sunday, March 8, I had the honour of attending a special event courtesy of Nike Canada, to celebrate the Nike+ 15K Race registration, and to learn about the exciting updates to the Nike+ services. In addition, myself alongside media influencers were invited to join a private panelist discussion, led by Nike Canada's Communications Director, Claire Rankine; Nike+ Running Global Head Coach, Chris Bennett; Nike+ Toronto Running Coach, Rejean Chiasson; Nike Master Trainer, Eva Redpath; and Nike athlete Phylicia George. The inspiring discussion was designed to provide insight on exciting news for the Nike+ services, the changes to the (ever growing) Nike+ Run Club and updates on the Nike Women’s 15k Toronto, including the Zoom mile and race registration details. To kickoff our running journey to the much anticipated June 14 race date, Nike Canada had designed a local 5K run at Queen's Park. A sea of motivated Torontonians (dressed in Nike Dri-Fit, how fitting) gathered at the MaRS Discovery District, in hopes to lock in a spot during the Nike Women's 15K Race. The local 5K was designed to mimic a race/marathon-esque vibe in order to train and run at your personal best time, led by a motivating bunch of Pacer leaders dressed in neon/fluorescent volt. Photo courtesy of @ChristinaGCheng via Instagram. After successfully completing the 5K at my own pace, I clocked in at 26:57 per net time; 5:24 per net pace; and 1:25:10 for my 15K predicted time. Now I'll admit, this was certainly not my personal best - I've done better. Nonetheless, there is evident room for improvement. For my personal best, I want to aim to complete the 15K with a time of at least 1:10:00 or better. With that being said, I would have to improve my overall net time and net pace. I still have some ways to go but I'm determined to conquer my personal best and successfully complete my first ever race on June 14. This lands just four days before my 26th birthday (June 18) and I'm motivated to gift myself this rewarding experience. The feeling of accomplishment once I hit the finish line was exhilarating to say the least; the amount of motivating cheers and high fives from your fellow running community was comforting and inspiring. Finding your second wind and sprinting to the finish line was almost innate when the adrenaline of your supporting community is cheering you on. It was a beautiful and liberating moment. I made it. I kid you not, as I was running, the sun was beaming and I felt an immediate blessing shower over me. I began to pray and thank God for blessing me with the opportunity to run alongside a motivating bunch of women on this beautiful day; which also happened to be International Women's Day. I remember seeking God's presence with me as I completed kilometre after kilometre. It was a beautiful run and I thoroughly enjoyed living and breathing in that moment, in my moment, as I shared the Queen's Park grounds with other runner's in their moment. The energy was unreal. Upon completing the run, and returning to the MaRS Discovery District for some refuelling, an announcement was made that a registration code was given behind all the participant's bib number for a chance to enter a random draw taking place on Monday, March 9, for the Nike Women's 15K Race! Feeling blessed beyond words, I was told that myself, alongside a few others were guaranteed entry. That immeidately put everything into perspective. It was officially grind mode. Now, many have tactics to training for an upcoming race but through partaking in Nike Running and Nike Women communities, I've learned that the secret to successfully training and accomplishing any challenge, is to do it together. Getting stronger together, aiming farther together, going faster together, and helping one another reach/exceed each other's personal goals through motivation is key. The Nike Women’s 15K Toronto includes the first-ever Nike Women’s Toronto 15k, a race designed as a proving ground, set to challenge runners to achieve their personal bests and showcase their speed. The race will be held on Toronto Island, in full view of the city’s iconic cityscape and will bring runners on a premium and exhilarating course experience. Toronto is one of 20 cities taking part in the 2015 Nike Women’s Race Series, and among nine hosting a Nike Women’s race for the first time. For those tracking your journey via social channels, please share, hashtag, and tag: #NRC, #BetterForIt, @NikeToronto, @NikeRunningCAN. The Nike Women’s Race Series is a celebration of sports and culture. The Toronto weekend is inspired by the energy and unique neighborhood feel of city – one of the most ethnically diverse cities in the world – and brings a unique Toronto take on Nike’s vision to connect athletes within a global community. Remember, "If you have a body, you are an athlete." I'm looking forward to sharing the road with you in the month of June. Stay strong. Stay motivated. We're in this together. JUST DO IT.